The DEWALT DWE7491RS offers the ultimate in table saw mobility by pairing a DEWALT 10 in. table saw with a rolling stand. This table saw is designed with a 15 Amp motor that quickly rips through hardwoods with ease. A rack and pinion fence system makes fence adjustments fast, smooth and accurate. The rolling stand is designed for easy set up and break down with excellent stability. 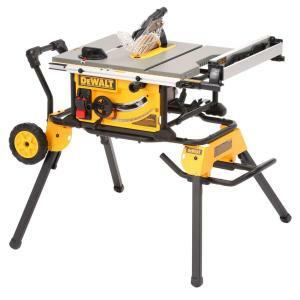 Tbook.com crawls the web to find the best prices and availability on Table Saws and related Tools and Hardware products like Dewalt 15-Amp Corded 10 inch Job Site Table Saw with Rolling Stand. For this page, related items include products we find that match the following keywords: "Table Saw" at our vendor partner Home Depot. Dewalt 15-Amp Corded 10 inch Job Site Table Saw with Rolling Stand is one of 60 Table Saws and related products listed in the Tools and Hardware section of Tbook.com If you have any questions on this product, please give us a call at 734-971-1210 during the hours of 9am - 5pm EST for assistance. Thank you for shopping at Tbook.com, the Internet Department Store!